Enjoy a slice of this old-fashioned spice cake with a glass of ice cold milk. 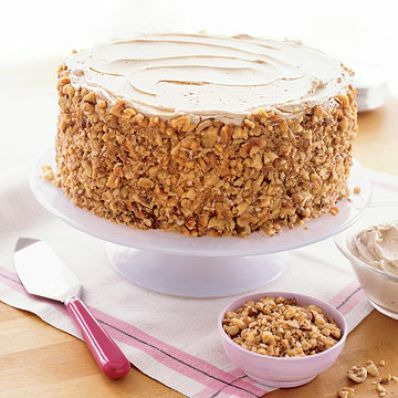 Toasted walnuts pressed on the side of the cake make an attractive and tasty garnish. 1 of 4 Heat oven to 350 F. Coat two 9-inch cake pans with nonstick cooking spray; line bottom with parchment or waxed paper and spray again. 2 of 4 In bowl, whisk flour, baking soda, cloves, cinnamon, nutmeg and salt. Set aside. 3 of 4 In a second bowl, beat together both sugars and shortening until combined. Beat in eggs, one at a time, beating well after each addition. Beat in the dry ingredients in three additions, alternating with the buttermilk. Beat 2 minutes. 4 of 4 Divide batter between prepared pans. Bake at 350 F for 35 minutes, until toothpick inserted in center comes out clean. Cool in pans on wire rack 12 to 15 minutes. Turn cake layers out and cool completely. 1 of 2 In bowl, beat shortening, butter and extracts. Gradually beat in confectioners sugar then 6 tablespoons of milk; beat until smooth, adding more milk as needed for good spreading consistency. 2 of 2 Place 1 layer on serving plate. Spread with 1 cup of frosting. Place second layer on top. 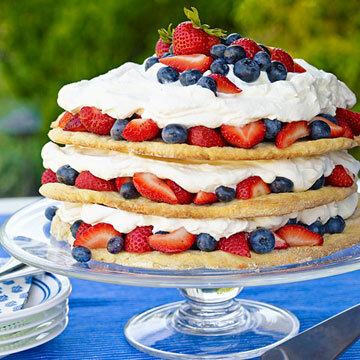 Frost top and sides of cake. Gently press chopped nuts onto sides. Per Serving: 183 mg sodium, 1 g fiber, 77 g carb., 25 g Fat, total, 535 kcal cal., 5 g pro., 7 g sat. fat, 46 mg chol.